In the most basic sense, subleasing means that you have a rental property that you intend to have someone else rented. This means that subleasing only occurs when you have signed a rental agreement with the original landlord and have asked the permission to have someone else rent it out for you for a certain period of time. Thus, when you sublease the property you become the sub-landlord or sublessor and the person renting it is the sublessee. In this article, various agreements for rental subleasing templates and examples you can download are provided. It’s important to explain to your sublessee how this current arrangement will go. 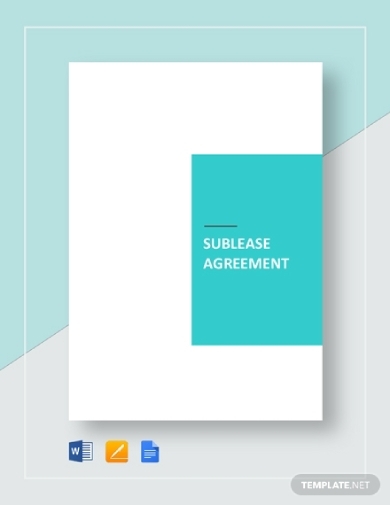 You should provide a document that will help the sublessee understand that you’re only the sub-landlord or sublessor and not the actual owner of the property; hence, he or she needs to adhere to the same terms and conditions such as property management, the basis for violations, and so on. 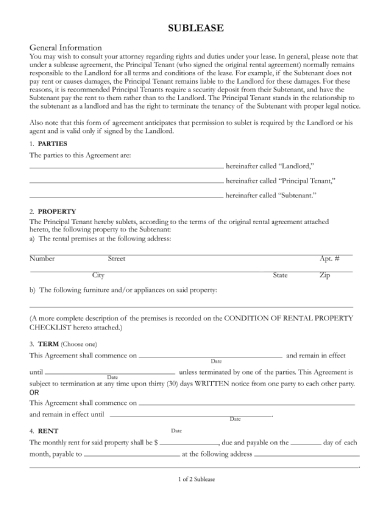 If you want a well-made template for this, you can download this rental sublease agreement template from this article. If the commercial property you have rented still has enough room for another business or office to occupy, it is ideal to have it rented out. This will surely help you pay for the rental fee each month, but it’s important to remember that you still need to ask your landlord if he or she is okay with the idea. If so, you should provide a sublease agreement that clearly explains each stipulation to achieve a peaceful and organized subleasing situation. 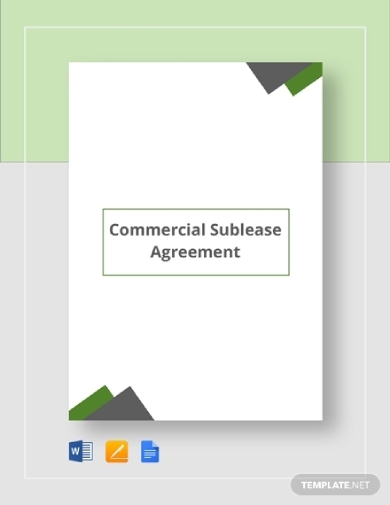 You can download this commercial sublease agreement template to get a good head start. Since all the terms and conditions relating to renting the property is clearly explained in a rental sublease agreement, it helps both parties become aware of their obligations. It legally binds each party to provide and fulfill all their respective obligations and responsibilities. Thus, it is important to have a well-structured and well-written agreement to give to your sublessee to avoid issues and problems. When you draft your sublease agreement, it is best to tailor it based on the stipulations of your original lease agreement. Doing this will ensure that you and your sublessee do not commit violations as stated in the original agreement. 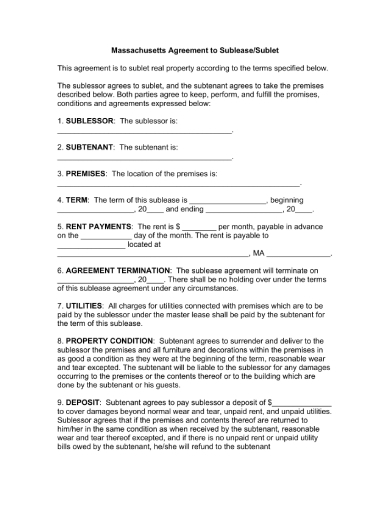 You can use this simple rental sublease agreement example as your guide as you create an agreement to use when you sublease a property. 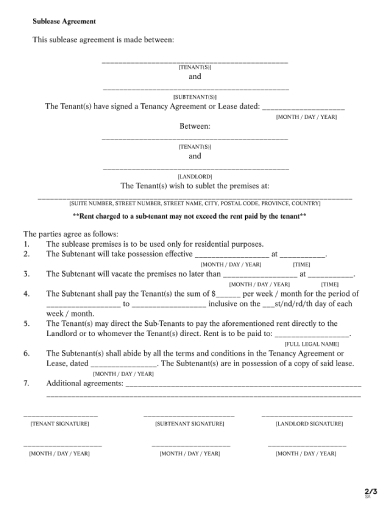 Legally bind your sublessee to the terms and conditions you set forth with your agreement to sublease or sublet. The document will explain all the important aspects regarding subleasing situations such as property rules and regulations, rental fee, payment schedule/s, and so on. The agreement you provide should be direct and clear for easier comprehension and adherence. 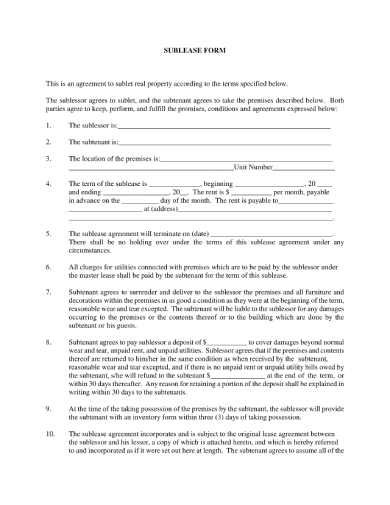 Help your sublessee easily understand the premise of the agreement by using a standardized, clear format similar to this example. 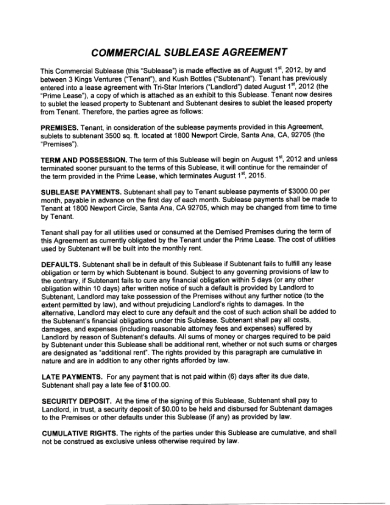 This basic rental sublease agreement example uses a simple and comprehensive format that immediately provides all the necessary information about the subleasing. You can download this example and use it as your reference during your creation process. Although you can always opt to shorten and simplify the agreement especially when it is just as simple as subleasing the property to a roommate, other situations merit a more detailed agreement. In this case, you should consult a legal adviser to help you create a detailed rental sublease agreement that provides all the essential details needed to make the subleasing formal and official. Some universities allow their students to sublease their door rooms to other students. They provide students with the rental sublease agreement that they give to their sublessee to ensure that both parties will still adhere to the set rules, terms, and conditions in the main room rental agreement. 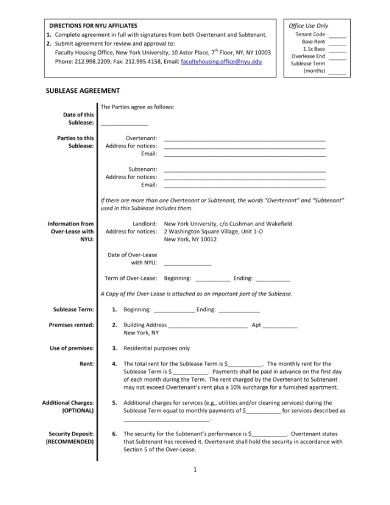 Here is an example of a university-issued sublease agreement that you can use a guide. To make it easy for your sublessee to understand, it is best to provide a brief agreement that lays out all the terms and conditions relating to the subleasing. It explains the details relating to the rental sublease fee, policies, property management, and so on. A comprehensive agreement will help the sublessee abide by all the terms and conditions since it is clearly explained in the document. 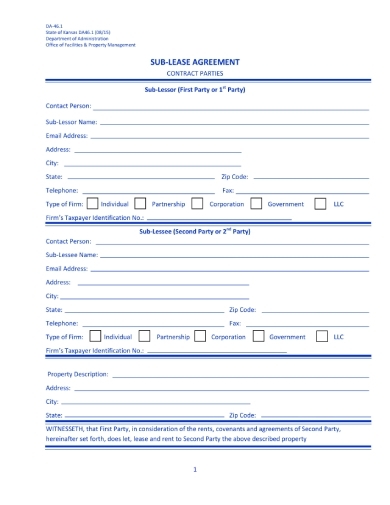 Having a fillable form for the sublease agreement will help make the transaction become more efficient. 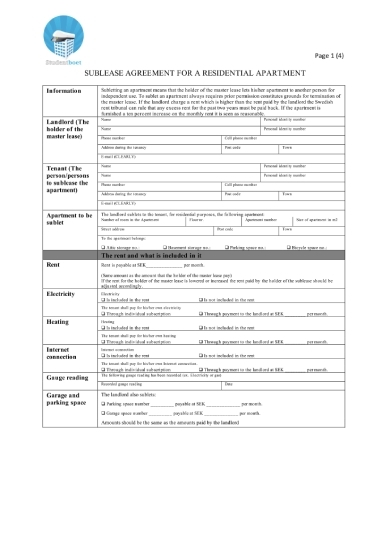 A rental sublease agreement form will allow you to handwrite all the necessary details. Looking at this example, you can clearly see how all the important details such as both parties’ names, address, contact information, etc. as well as the information about the property and sublease are all accounted for. When you are creating a commercial sublease agreement, it is best to tailor it to the original commercial lease agreement. Doing so will help you take into account all the stipulations and terms that the landlord has stated in that said agreement. Thus, helping you adhere to said terms even when you sublease the property. If you want a guide and reference for this, you can download this example for free from this article. If you want to travel to another country for a couple of months and still want to have an apartment to go back to the best option for you to sublease the residential apartment that you have rented for a specific period of time. Doing so will help still generate income to help pay for the rental fee. In that case, you should provide a clear sublease agreement to the sublessee to explain that this arrangement is only good for a certain period of time. Looking for a short rental sublease agreement that you can use as your guide and reference? 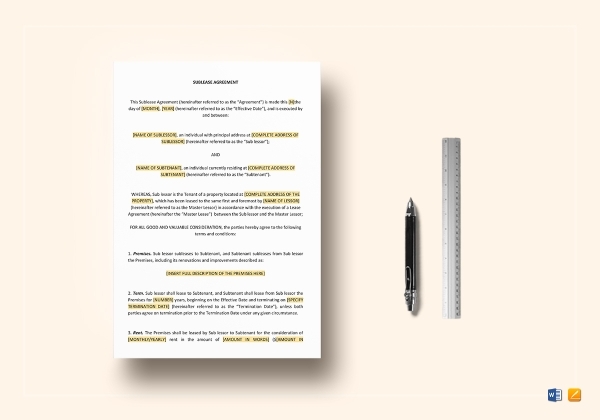 You can download this example to help you create a clear outline for the agreement you’re going to use when you sublease your rental property. This has a clear format and well-written content that will help you clearly communicate your terms and conditions to the sublessee.